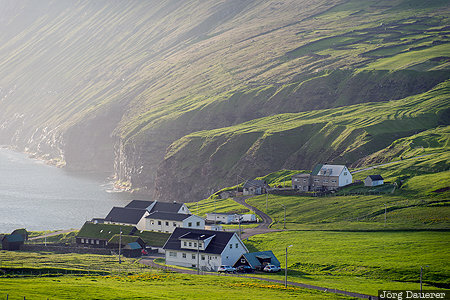 The houses of Viðareiði in front of the steep coast and the back-lit rocky green meadows of Viðareiði. The island Viðareiði is part of the Northern Islands, Faroe Islands. This photo was taken in the evening of a sunny day in June of 2017. This photo was taken with a digital camera.